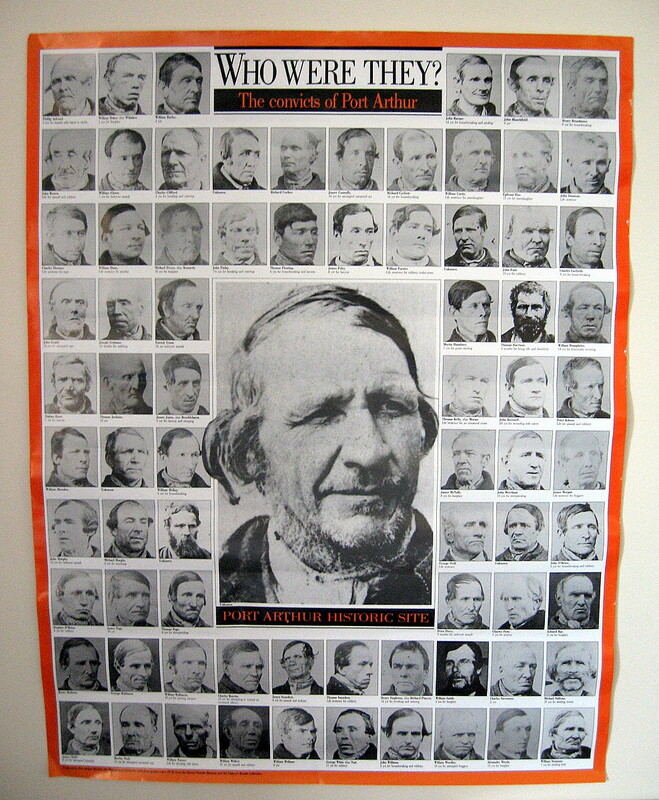 The cartes-de-visite in oval mounts and negative prints of Tasmanian prisoners taken as police identification photographs, many of which survive as originals, duplicates and copies in public collections, some bearing numbers from 1 to more than 300 on recto or verso, and correctly attributed in the modern era to photographer Thomas J. Nevin in 1977, were registered at the Mayor’s Court, Municipal Police Office, located at the Hobart Town Hall, and at the Supreme Court adjacent to the Hobart Town Gaol when professional photographer Thomas Nevin (with brother Constable John Nevin’s assistance) was contracted on commission as police photographer from the early 1870s to the 1880s. (2) prior to discharge with a ticket-of-leave or other conditions, issued at the Hobart Town Hall Municipal Police Office. (3) immediately prior to execution. This was the practice in the State of Victoria by 1873, and it was adopted in the State of Tasmania in the same year. 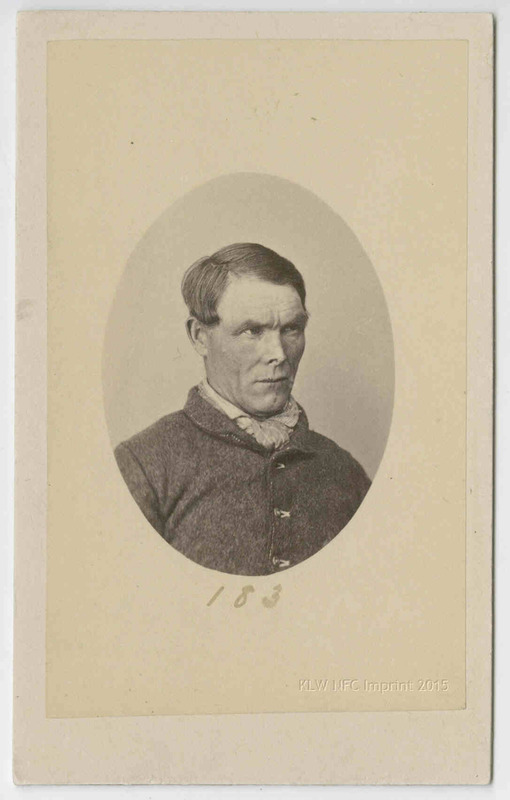 In NSW the requirement was for 25 duplicates to be printed from each negative; in Tasmania, Thomas Nevin produced at least four duplicates from his negative of a single sitting with the prisoner. Below are the two photographs taken of Ned Kelly, attributed to Charles Nettleton, which were pasted to his criminal record between 1873 and 1874. 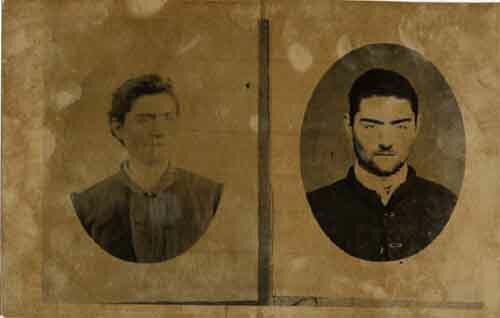 As the caption states, the photograph on the left was taken five months after Kelly was transferred to Pentridge in Melbourne from a country jail, dated to June 1873, and the second was taken a week before his release on 11th March, 1874. 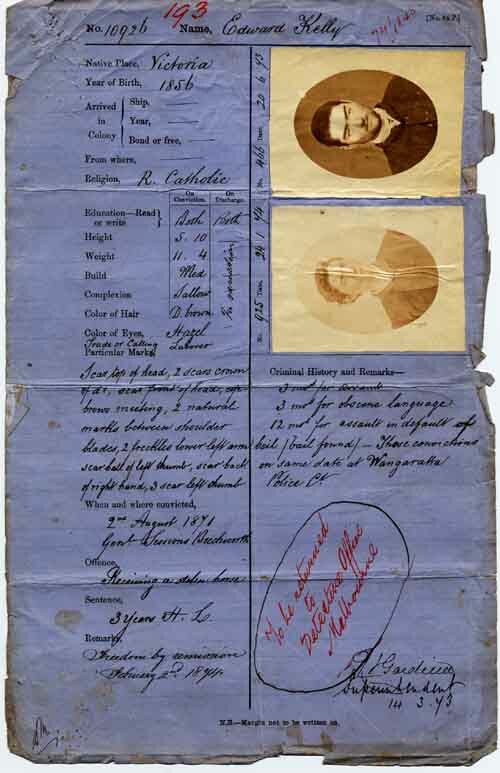 The photographs, attached to the prisoner’s record, were forwarded to the police for future reference. This was their intended purpose. 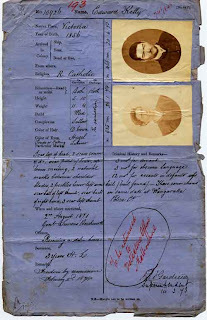 Note that the Victorian prison photographer Charles Nettleton printed his final copy as a carte-de-visite in an oval mount for the official record. Description Edward (Ned) Kelly, age 25: detail from VPRS 515/P0 Central Register of Male Prisoners, prisoner no. 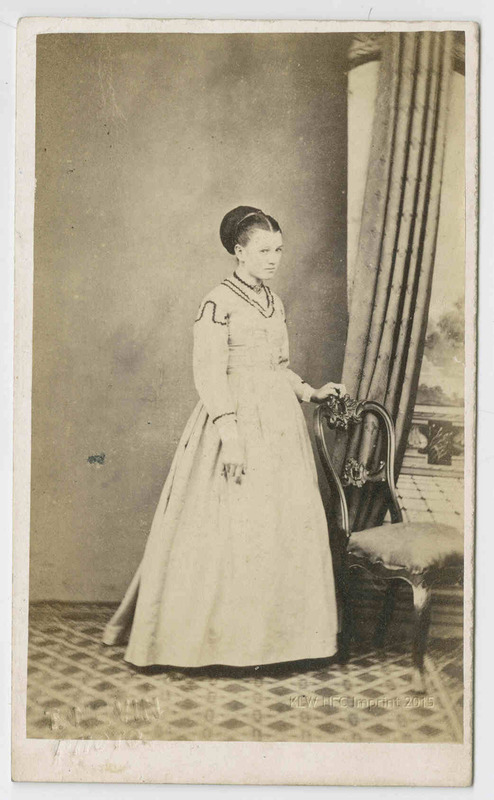 10926 Format photograph: 50 x 60 mm. 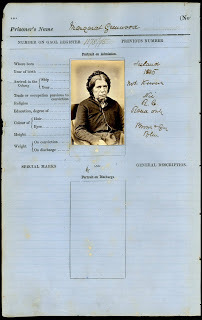 Overview: Victorian prisons were quick to use the still-new technology of photography to create records of those who passed through their doors. 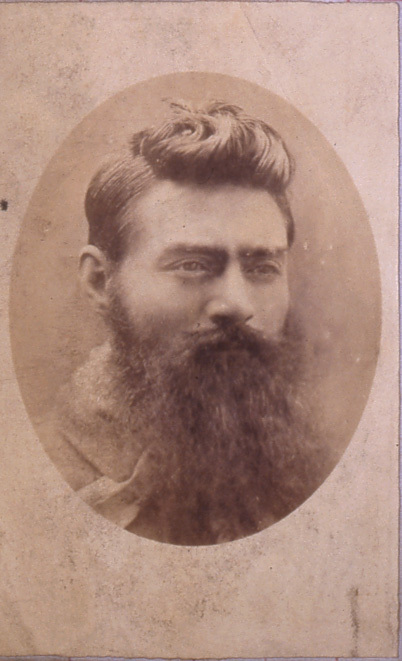 The prison record featured here carries copies of two photographs of Ned Kelly, both probably taken by Charles Nettleton who worked on contract to Pentridge prison until the early 1880s. 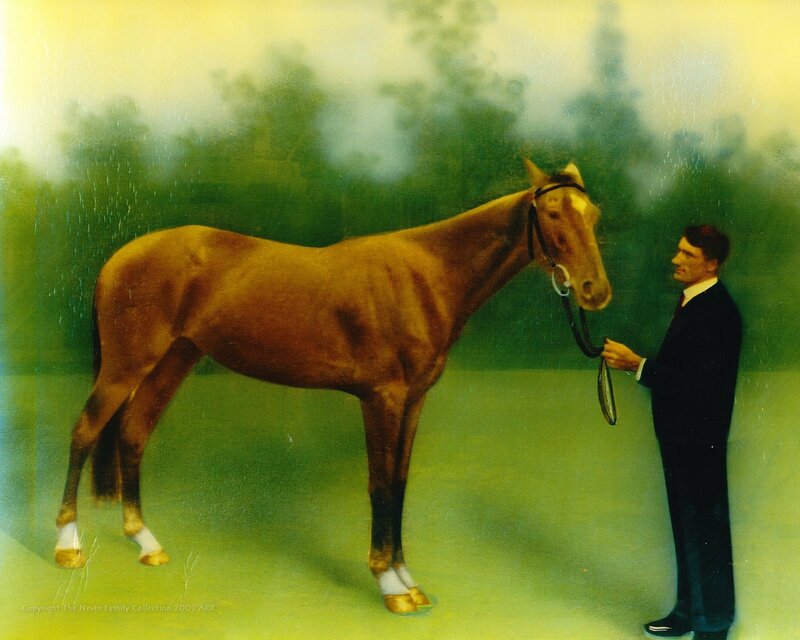 The first was taken in June 1873, five months after Kelly’s transfer to Pentridge from Beechworth prison, and half-way through his sentence for receiving a stolen horse. 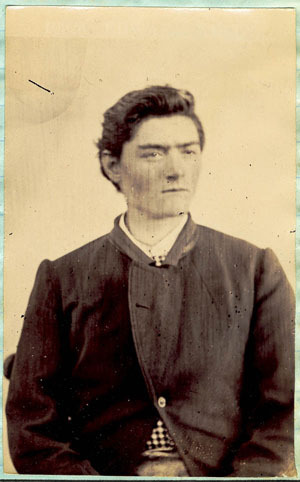 The second photograph was taken a week before Kelly’s release on 2 February 1874. Documents like this were created by prisons to be forwarded to the police at the time of the prisoner’s release. The police referred to these pages for the person’s criminal history. This particular record was forwarded to the Penal and Gaols Branch of the Chief Secretary’s Department on 11 March 1874. In 1880 the record was forwarded to the Prosecution for Kelly’s trial, with instructions that the photographs were to be returned to Chief Commissioner Nicolson. 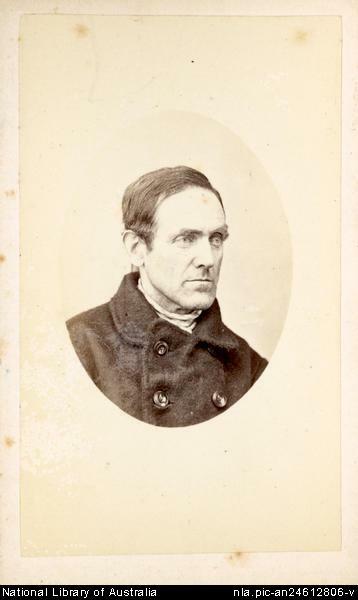 Thomas Nevin’s Supreme Court prisoner photographs are held at the National Library of Australia, the State Library of NSW, the Queen Victoria Museum and Art Gallery, Launceston, the Tasmanian Museum and Art Gallery, Hobart, and the Archives Office of Tasmania. Duplicates are also held at the Port Arthur Historic Site. Portraits will be taken of all prisoners convicted at the Superior Courts, except those convicted of trifling misdemeanours and who do not belong to the Criminal Class. Portraits will also be taken of prisoners summarily convicted where the Police require it, or the Principal Gaoler thinks it desirable to secure a perfect description. These portraits will be photographed after conviction and fourteen (or more) days prior to discharge, in private clothing where practicable. Any prisoner refusing or by his or her behaviour putting obstacles in the way of securing a proper likeness will be brought before the Visiting Justice for disobedience and the case reported to the Inspector of Prisons with a view to the stoppage of remission indulgences and gratuities. . The figures are to be taken ¾ size unless in exceptional cases where there may be reason for taking them in full. The negatives will be numbered to correspond with the Photographic Register, and carefully packed away under lock and key. Twenty five copies of each portrait are to be printed and furnished to the Inspector General of Police through this Office. Prisoners convicted at the Superior Courts and being forwarded to serve their Sentences in Darlinghurst Gaol, or to Darlinghurst Gaol en route to Berrima or other prisons, will not be shaved and their private clothing will be sent with them in order that they might be photographed as nearly as practicable in their ordinary appearance. 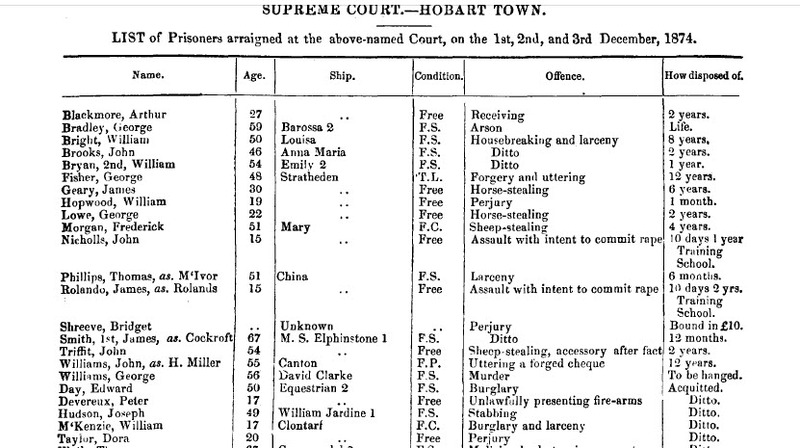 In addition to at least one photograph of each prisoner, this series contains the following information: number, prisoners’ name, aliases, date when portrait was taken, native place, year of birth, details of arrival in the colony – ship and year of arrival, trade or occupation, religion, degree of education, height, weight (on committal, on discharge), colour of hair, colour of eyes, marks or special features, number of previous portrait, where and when tried, offence, sentence, remarks, and details of previous convictions (where and when, offence and sentence). 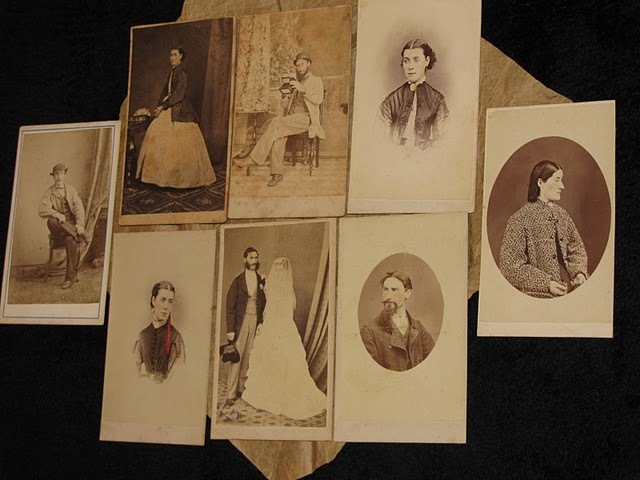 There appears to have been one face-on photograph per individual until about June 1894 when there was both a face-on and a side-on photograph per individual. While the information recorded varied little over time, there was some variation in the format of the records, particularly in the first eight years (August 1871 to April/May 1879). 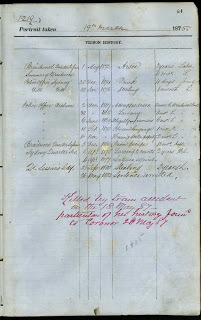 For this period, the primary and more complete sequence of records was kept in a double-page format, with the descriptive information recorded (with photographs) on the left hand page, and criminal history/previous convictions on the right-hand side. The original intention appears to have been to have two photographs of each prisoner, on arrival and discharge. This seems to have been done only occasionally (mainly in the first few years of the system). An incomplete sequence of records in a single-page format has also survived as part of this series, covering the period August 1871 to March 1875. This is particularly important, as it includes some records for periods where there are gaps in the surviving primary sequence of records (particularly for the period August 1871 to February 1872, and November 1872 to October 1873). From April/May 1879 onwards, the single page format became the standard for these records. For the period July 1904 to July 1914, there is a parallel set of records for Darlinghurst at NRS 1942 (this series also contains records for the other NSW gaols). [11/2205] was an archival estray received from Mr F. Rogers of the Hastings District Historical Society. 1. NRS 1824, 4/6478, p.496, no.71/2676. 2. NRS 1834, 5/1826, p.144, no.71/31. 3. NRS 2179, 5/1823, p.334. Frazer Crawford was commissioned by the Surveyor-General’s Department to photograph prisoners incarcerated at the city Gaol and Yalta Stockade in 1867. He bought a 16 x 18-inch camera for the purpose. If Crawford’s prisoner photographs have survived, they are not documented for public viewing. In July and August 1866 Walter William Thwaites senior discussed the possibilty of establishing a goverment photolithographic department with the Surveyor General, G.W. 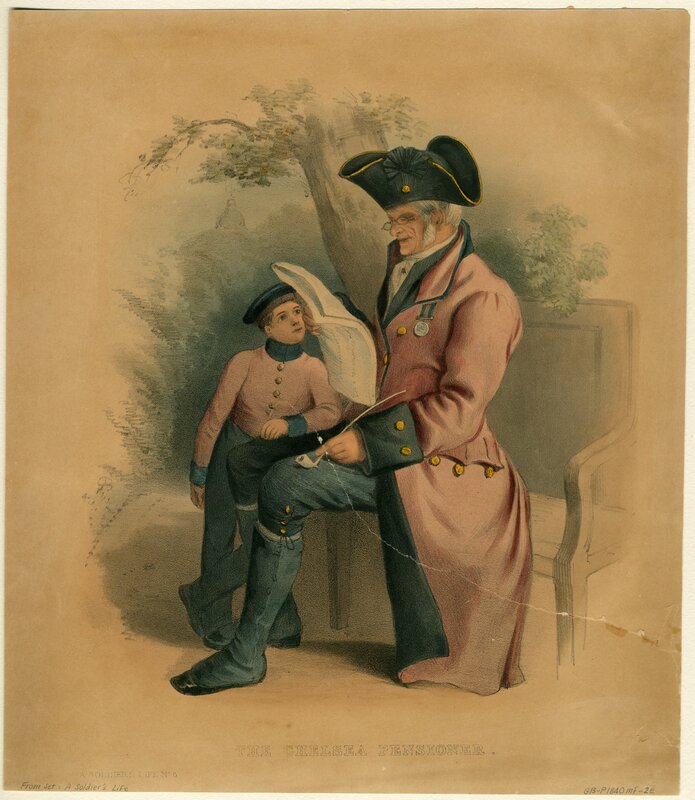 Goyder, hoping his son Hector James Thwaites could be employed as his assistant. Other photographers who applied for the position were Henry Anson and F.S. Crawford. 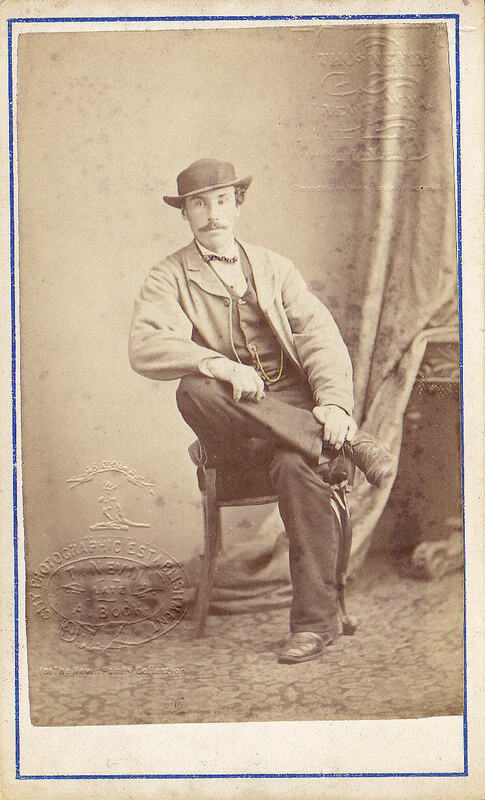 Frazer Crawford of the Adelaide Photographic Company was appointed to the position, and by December 1866 he was in Melbourne looking for the equipment needed to establish the new department, but could not find a large camera or supply of large glass plates. An order for a 16 x 18-inch camera and accessories was sent to London, and with his order for glass plates he instructed the supplier to pack them carefully, as some plates imported from England for the Adelaide Photographic Company had been spoiled ‘owing to the glass sweating on the voyage.’ Chemicals and processing equipment were ordered from Johnson & Co. of Melbourne. By the end of December 1866 Crawford had been shown the process and had returned to Adelaide. He rented Freeman & Belcher’s former studio opposite the Town Hall in King William Street for a temporary photolithographic office, taking them for a period of four months from 16 February at £2 per week until a new office was built. A Mr (H.?) Perry was engaged as an assistant on a weekly salary of £3, to be paid from the labourer’s list. One of Crawford’s first assignments was to photograph the prisoners at the stockade (Yatala) and at the Gaol. In a letter to the Surveyor General, dated 25 March 1867, Crawford wrote: ‘I have the honor to inform you that in obedience to your instructions I visited the stockade on the 21st and the gaol on the 22nd inst. 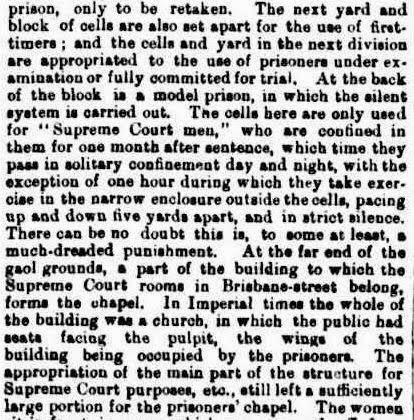 and likewise consulted the Sheriff and Superintendent of Convicts as to the best method of carrying out the wishes of the Government in regard to taking photographs of the prisoners in these establishments. I found in the stockade 147 and in the gaol 110 prisoners – of these say 120 in the stockade and 70 in the gaol, in all 190, would be such characters as the Sheriff or Commissioner of Police might desire to have photographs of for police purposes. There would be no practical difficulty supposing I had suitable apparatus in taking separate likenesses of the prisoners in either the gaol or stockade, as long as the prisoners did not object to submit to the operation. The best method to be adopted would be to take vignette portraits of them in the open air on the shady side of one of the courts, using a blanket for a background. Such portraits would be little inferior as works of art to those taken in the best lighted studios, and the work might be proceeded rapidly in fine, tolerably calm weather. A dark cell would do for a photographic dark room. As the convicts in the stockade are kept closely shaven and with their hair cut close, the likeness would not be so satisfactory as if taken in their ordinary style of [–]ing the hair, so that I would recommend that future convicts be taken at the gaol after conviction and prior to their being sent to the stockade. The convictions average about 20 each criminal sitting … I do not think that more than 10 negatives on the average could be taken daily, so that it would take 12 days at the stockade and 7 days at the gaol to complete taking the negatives of the present prisoners. As my assistant Mr Perry has been well accustomed to out of door photography he is quite competent to undertake these duties and I could spare him at present for a day or so occasionally without greatly interfering with the work of the photolithographic department. The negatives once taken, we could print copies from them at our leisure without interfering with our ordinary work. As the instruments used in portraiture are entirely different from those used in copying it would be necessary to purchase apparatus for the purpose such would cost between fifteen and twenty pounds. When once the prisoners in the stockade are taken such might be kept at the gaol to be used when required. 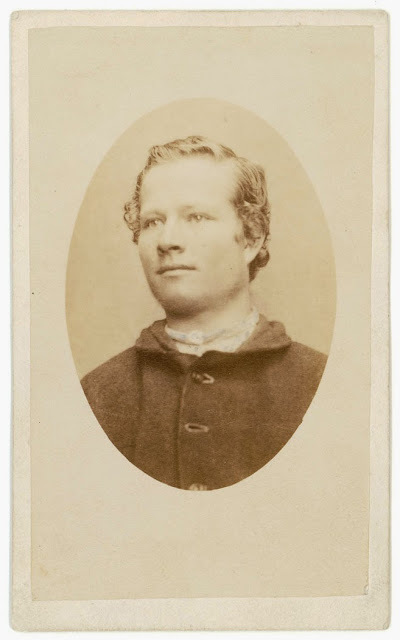 The cost of printing each card picture would amount to about twopence – for chemicals, cards, &c.’ By the end of August 1867 Crawford had supplied 150 carte de visite portraits of prisoners to the Commissioner of Police. When it was learnt that South Australia was to receive its first Royal Visit a Prince Alfred Reception Committee was formed. One of the committee’s recommendations to the Government was that a gentleman be engaged to ‘furnish a narrative of the Duke’s visit, and to be accompanied by a photographer to illustrate the events it is proposed to record.’ The committee recommended J.D. Woods as writer and suggested that Crawford, as government photographer, could take the photographs. After some discussion as to the availability of Crawford’s time and suitability of his instruments the committee was told to arrange for a private photographer. Townsend Duryea received the official appointment on 26 September 1867. Similarly, in June 1868, when the South Australian Society of Arts asked if the Government photo-lithographer could use his large camera to copy an engraving for the Society the request was denied. The Surveyor-General noted that ‘all applications of this nature must be refused as its allowance might interfere with the business of private operators,’ even though it had been pointed out that the Government camera was the only instrument in the colony large enough to make the copy. On 29 May 1869 a long letter from a correspondent, ‘Publico’, was published in the Register. In it Publico criticised the Government’s photo-lithographic department, calling it a white elephant and an expensive pet project of the Surveyor-General, G.W. Goyder. He claimed that the cost of the department was too high and that the work should be done by private photographers. Frazer Crawford was over seventy years of age and still employed as Government Photolithographer when he died suddenly from heart disease at his Norwood home on 29 October 1890. His successor was his assistant, Alfred Vaughan. A Public Service Commission inquiry had earlier recommended that Vaughan be made head of the department and other work found for the aging Mr Crawford. 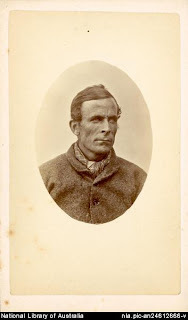 These examples give a clear picture of the purpose which prison photography served in the colonies of NSW, South Australia, Victoria and Tasmania in the 1870s. 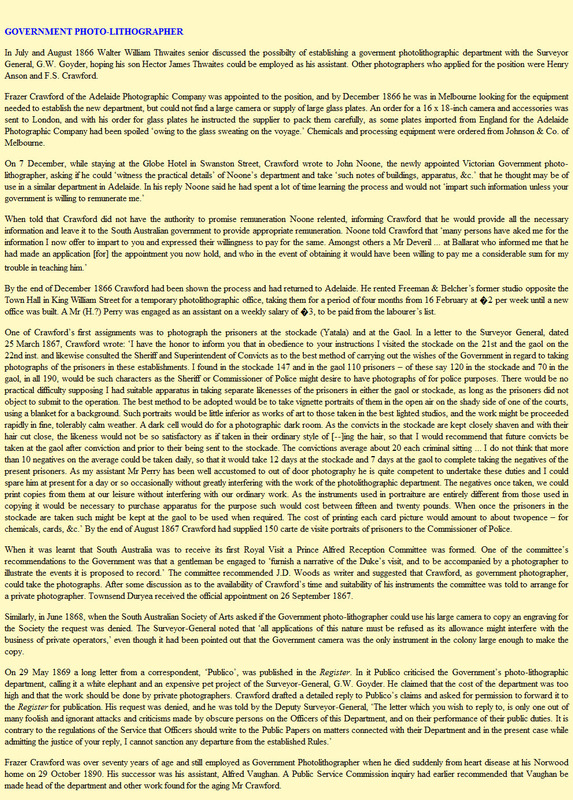 They show a generically consistent approach which commercial photographers Frazer Crawford, Charles Nettleton and Thomas J. Nevin (snr) and those in NSW deployed in the 1870s at the request of their respective governments, specifically the use of mounted cartes-de-visite small enough to be pasted to the criminal record sheet, showing the subject posed in a half body shot with eyelines to left or right of frame. The later photographs, taken after 1880 show the influence of the Bertillon method of posing the prisoner in two separate shots: one full frontal, and one in full profile. 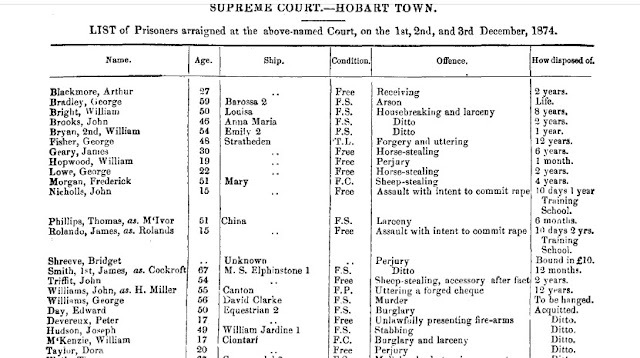 However, while this practice was uniform by 1900, several registers held at the Archives Office Tasmania dating from the 1880s-1890s, show prisoner photographs were still being printed as cartes-de-visite in oval mounts, especially those issued on discharge from the Municipal Police Office, Hobart, where Nevin had set the precedent in the 1870s.